Cast your mind back to a time when Mel Gibson wasn’t someone that a movie producer would avoid like leprosy. Seems difficult to imagine, doesn’t it? 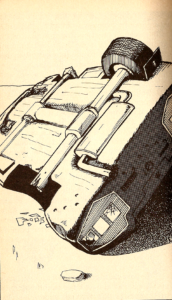 We’re talking 1985, a mere 4 years after ‘Mad Max 2’ hit cinemas. A post-apocalyptic world which didn’t involve zombies? Sure, it happened. What it did involve, though, were biker gangs and juiced-up cars. This book never appealed to me. It still doesn’t. Nothing about this type of sci-fi appeals to me, it’s just not my bag. I didn’t bother with this as a kid, and under other circumstances I wouldn’t bother with it now. But I’ve been wrong about first impressions before, so I’m going to give it a damn good shot. According to the backstory of this book, a mysterious virus killed off most of the world’s population, leaving those who remained to struggle for survival… which you’d kinda expect, given how few people there are, would be kinda abundant. Apparently people would kill over a tin of beans, which is just strange if there’s only 15% of the population left trying to acquire all the tins of beans in the planet, there’d surely be plenty to go around… why am I over-thinking this? There’s worse things to worry about. Like the way that this virus is meant to happen in the far-off future year of 2022!! Scared yet? You should be, because I’m one of the survivors, and I’ve been asked to drive across the country to pick up some petrol (or ‘gas’) from another settlement of survivors. And to help in my travels, I’ve been given a Dodge Interceptor car. With mounted machine guns. And rocket launchers. 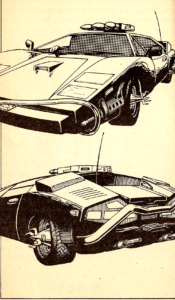 Why does the car need rocket launchers? Isn’t that a bit excessive? Anyway, I’m going also name my character, I will not call him ‘Mad Max’ though. Instead in a truly inspired creative move, I will call him ‘Slightly peeved-off Kevin’. Slightly Peeved-Off Kevin has a nice skill of 12, a luck of 9, and a stamina of 30. Yes, 30. The book tells me to add 24 to his stamina roll. My guess is that Kevin has bullet-resistant skin. On the other hand, this could mean that there’s going to be a LOT of combat in this game. Oh boy… My car also has its own stats, with an 8 in firepower an a 32 in arour plating. And rockets, did I mention those? Yeah… Right, let’s drive. A short way from my home base, I hear sounds of gunfire. I pull over to investigate, and I’m confronted with a man wielding a shotgun who insists that I recently shot his wife and kids. I try to explain to him that I didn’t, and wind up pointing my gun at him. If this was ‘The Walking Dead’, I’d expect things would end in a far more gruesome manner, but this time the man relents and apologises. I give the chap some directions back to my home base so that he can go and rest up for a while, and in exchange he tells me to avoid the petrol station further down the road as it is held by a gang of bandits. Naturally I take his advice, and when I later see the petrol station I drive right past it. The book then tells me that I’m tearing down the road at several kilometres an hour… wait, kilometres? From the language of the title (Freeway, isn’t that an American word), I expected my car would be running on miles ubstead. 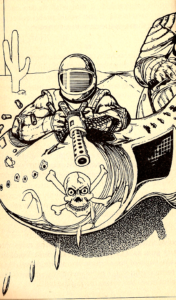 I wonder for a while about the post-apocalyptic embrace of the metric system… oh wait, no time to think about it, a red chevy is shooting at me. The combat system for firearms in this book is just painful. It determines damage by dice roll, not a standard set amount, which means that in any one round you can do a massive amount of damage, or barely do any at all. I manage to eventually blow up the chevy, but not without my own car’s armour rating plummeting down to a 3. A three. From a 32 down to a 3 in a single round of combat. Oh lovely. Y’know, I don’t want to be one of those “I hate everything, grrr angry” type of reviewers, but there’s really no way to hide the fact that I’ve not been enjoying this book so far, and that one single combat encounter shows pretty much why. I will now need to find somewhere to get my car fixed, before I accidentally crash into a stray sheep and die in the resulting fiery car explosion. I get back into my car after surveying the wreckage, I get a radio message from home base telling me that they have been attacked by a gang of bikers and begging for assistance. Probably against my better judgement I decide against this quest, reasoning that heading back to home base will consume more petrol than I can spare. After a while I reach an area of the highway that is blocked with abandoned and wrecked cars, causing me to take a diversion which leads to a river. In order to cross a bridge – however the bridge is partly open so if I want to get over it I’ll have to get the car to jump the gap. That should be easy enough, given that my car has a ‘stamina’ of only 3 left and no way to heal it back up, which I take to mean that the only thing stopping the car from falling apart is the duct tape I’ve wrapped around it. Eh, never mind that, the book decides to give me one of those ‘fight two enemies at the same time’ combat sequences I do so hate. In fact, I suspect this may be the first of those. I manage to kill both bikers without too much trouble, probably because I’m not in my car any more. I search through the abandoned vehicles of one of the recent car pile-ups, only to eventually stumble upon a crowbar. I hope to find some petrol cans somewhere among the abandoned cars, but the book tells me that I ‘suddenly feel’ paranoid about my car and asks if I should run back to it. Afraid that some sneaky bugger has made off with the last of its armour plating (I can’t think why, because the damn stuff is obviously made of tin foil), I hurry back to my car, only to find that it is quite fine. I just didn’t care for this book at all. 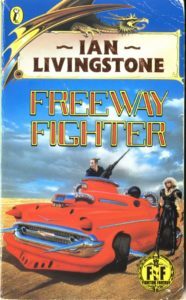 The setting isn’t interesting, the combat feels far too random (entirely due to the ‘roll a dice to determine how much damage you do’ mechanic used, to the best of my knowledge, in this book only), the artwork is some of the poorest in the history of Fighting Fantasy, and you end up feeling as if you’re attached by the hip to the damn car. It’s just not much fun, I’m afraid. Cause of death: Out of gas.